The main thing to focus in Venn Diagram is the intersection area of table A and table B. It is NOT highlighted in red because we don't want the records which are common in both the tables. 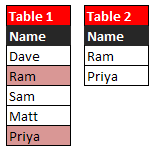 If you look at the tables below, we are looking to fetch all the records from table1 except 'Ram' and 'Priya' as these two names are in table2. The following programs create two data sets in SAS which are used to demonstrate methods to solve this problem. The simplest method is to write a subquery and use NOT IN operator, It tells system not to include records from dataset 2. In this method, we are performing left join and telling SAS to include only rows from table 1 that do not exist in table 2. In the first step, it reads common column from the both the tables - a.name and b.name. At the second step, these columns are matched and then the b.name row will be set NULL or MISSING if a name exists in table A but not in table B. At the next step, WHERE statement with 'b,name is null' tells SAS to keep only records from table A. NOT EXISTS subquery writes the observation to the merged dataset only when there is no matching rows of a.name in dataset2. This process is repeated for each rows of variable name. Step 3 - At the last step, it excludes common records. In SAS Data Step, it is required to sort tables by the common variable before merging them. Sorting can be done with PROC SORT. The MERGE Statement joins the datasets dataset1 and dataset2 by the variable name. Q. Which is the most efficient method? To answer this question, let's create two larger datasets (tables) and compare the 4 methods as explained above. SAS Dataset MERGE (Including prior sorting) took least time (1.3 seconds) to complete this operation, followed by NOT IN operator in subquery which took 1.4 seconds and then followed by LEFT JOIN with WHERE NULL clause (1.9 seconds). The NOT EXISTS took maximum time. Tip - In many popular forums, it is generally advised to use NOT EXISTS rather than NOT IN. This advise is generally taken out of context. Modern softwares use SQL optimizer to process any SQL query. Some softwares may consider both the queries as same in terms of execution so there would not be a noticeable difference in their CPU timings. Some may be in favor of NOT EXISTS. SAS seems to be in favor of NOT IN operator as it does not require tables to be merged. 2 Responses to "SAS SQL : Find records only exist in one table but not other "